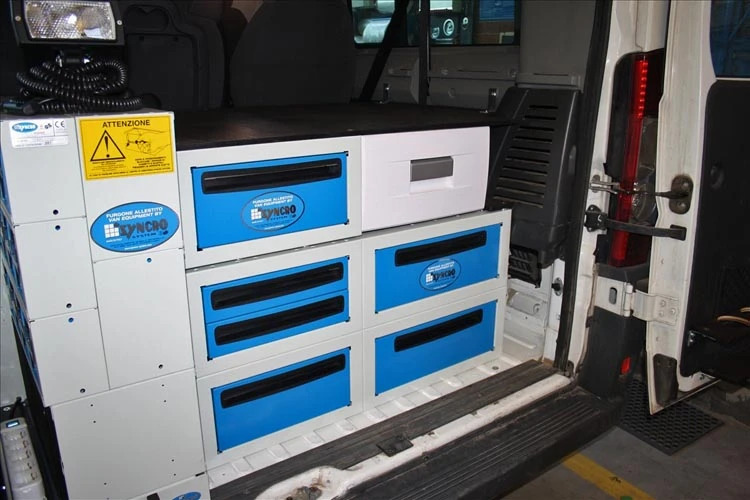 The technicians of the Syncro System Trofarello (Turin, Italy) branch have upfitted a van for the Veterinary School of the University of Turin. With just a few minor adjustments, the vehicle has become a perfect mobile laboratory for veterinary students. See photos. 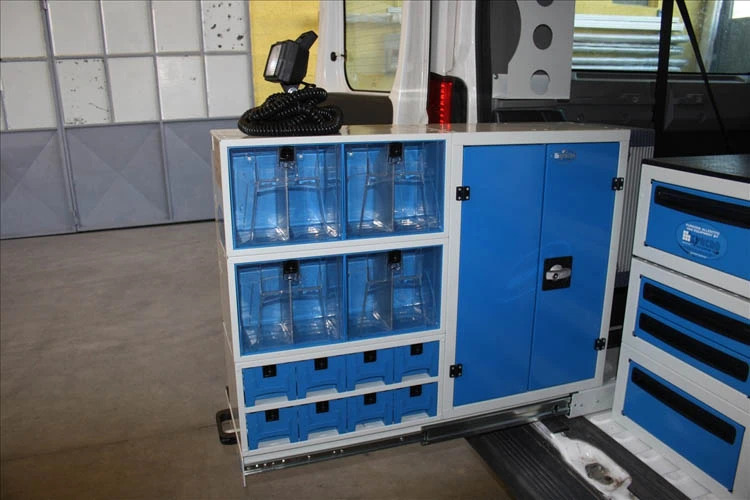 The Syncro System modular van upfitting system effortlessly adapts to the needs of each individual client. The upfit, seen in these photos, was commissioned by the School of Veterinary Medicine of the University of Turin. The van was already being used by the school to transport students to a nearby cattle ranch, but they also wanted to be able to use the van as a small mobile laboratory, so that the veterinary students could have all the necessary equipment on board in order to conduct on-site check-ups. 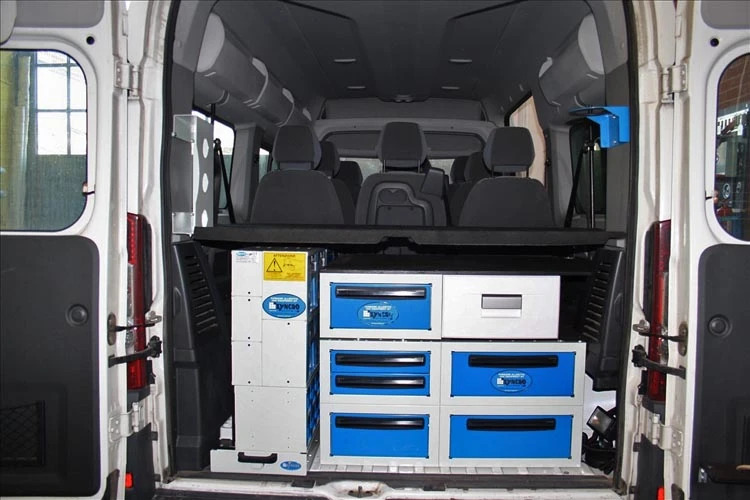 In this large van, six of the forward passenger seats were kept, leaving limited space in the rear of the van for installing the Syncro System racking units. Along the left hand side of the van at the far back, we installed a drawer unit mounted on a slide-out base, allowing it to be completely extended out of the van, when needed, for unobstructed access to all its contents. The unit contains four large clear plastic drawers, a series of smaller removable drawers, 12 forward-tilting drawers, and a small-size locker with locking double doors. Mounted to that, there is a sine wave inverter for the power supply of the electrical equipment in the vehicle. Because the drawer unit was placed length wise, to optimize use of the limited space, the Syncro slide-out base is an essential element of this upfit. To the right of this sliding unit, we installed a second drawer unit with six drawers of varying heights. The top drawer furthest to the right contains a small refrigerator compartment (with white front panel). Above the drawer unit is a resin-coated wooden worktop. 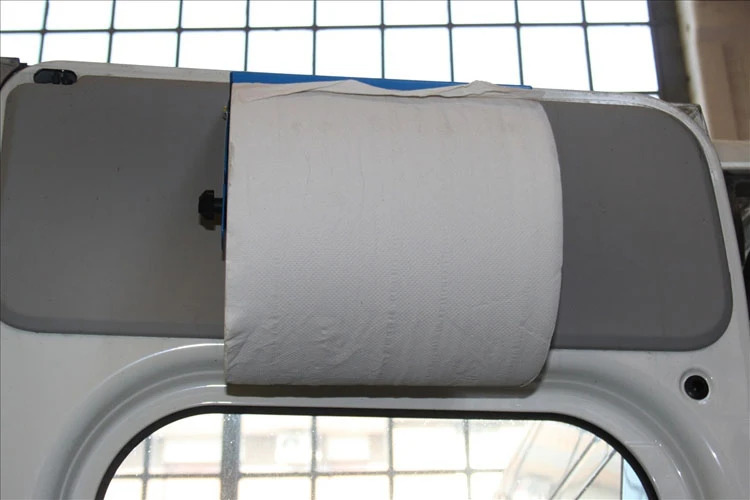 A few practical and convenient accessories were added to complete the upfit: a floodlight for lighting both the inside and outside of the van; a customized plastic bottle holder, mounted on the back door; a paper-towel roll holder; and a hanging storage net. Last but not least, on the left side (just over the drawer unit), we mounted a metal dispenser to hold the rubber surgical glove boxes required for medical procedures. With just a few minor adjustments, the vehicle has become a perfect mobile laboratory for veterinary students.